GRAND RAPIDS, Mich. - October 21, 2016 - Tillerman & Co.'s acquisition of Jackson Flexible Products, Inc. earned finalist honors in the fifth annual M&A, Deals & Dealmaker Awards presented by business publication MiBiz and the Association for Corporate Growth's Western Michigan Chapter. Read the story here. The transaction was named the finalist in the Less than $25 Million Deal of the Year category. Barnes & Thornburg provided legal counsel to Tillerman & Co. on the transaction. Comerica Bank provided financing for the transaction. About Tillerman & Co. Based in Grand Rapids, Mich., Tillerman & Co. provides investment and merchant banking services to middle-market businesses. The firm specializes in closely held and family-owned businesses with merger-and-acquisition advisory, capital sourcing and transaction support. The firm focuses on transactions valued between $3 million and $75 million in the manufacturing,distribution, agribusiness, energy, business services and consumer products sectors. For more information, visit tillermanco.com. Pictured: Remos Lenio and Phil Blanchard, CFA. (Photo courtesy of MiBiz). 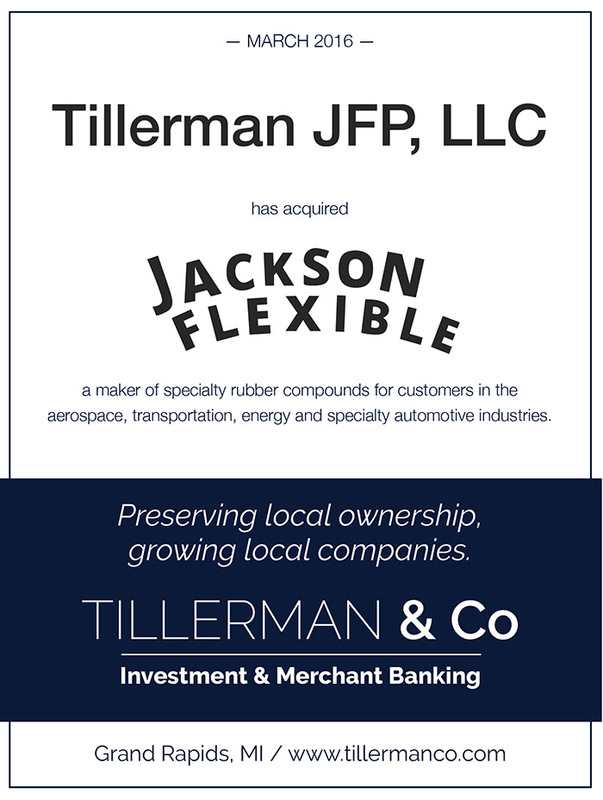 GRAND RAPIDS, Mich. - March 21, 2016 - Just five months after launching operations, Tillerman & Co. has completed its first transaction with the acquisition of Jackson Flexible Products, Inc., a Jackson, Mich.-based supplier of custom-formulated rubber parts used primarily in the aerospace industry. Terms were not disclosed. Grand Rapids, Mich.-based Tillerman & Co. announced it acquired Jackson Flexible Products from its founder, Ronald Jakubas, who started the company in 1969 to supply Aeroquip Corporation, now a division of Eaton Corporation. Jakubas, who plans to retire, met with several strategic buyers that were interested in consolidating Jackson Flexible’s operations into their own locations. Instead, Jakubas chose to sell to Tillerman & Co. because they were committed to keeping the company in Jackson. GRAND RAPIDS, Mich. - October 26, 2015 - A pair of veteran Michigan finance executives have christened Tillerman & Co., a new full-service investment and merchant banking firm focused on the middle market. Lead by co-founders Remos Lenio and Philip Blanchard, CFA, Tillerman & Co. plans to help closely held and family-owned companies with merger-and-acquisition advisory, capital sourcing and transaction support. The Grand Rapids, Mich.-based firm intends to focus on transactions valued between $3 million and $75 million in the manufacturing, distribution, agribusiness, energy, business services and consumer products sectors. In addition to its industry focus, Tillerman & Co. intends to pursue engagements with company owners who are preparing to sail off into retirement. Over one-third of mid-market sellers expect M&A activity will increase over the next few years as more owners reach retirement age, according to a report by Providence, R.I.-based Citizens Commercial Finance. For many of those Baby Boomer-aged owners, there’s a growing concern related to legacy issues, succession planning and losing key employees, according to Tillerman partner Lenio. Lenio and Blanchard are known throughout the midwest for their M&A advisory and investment banking work. 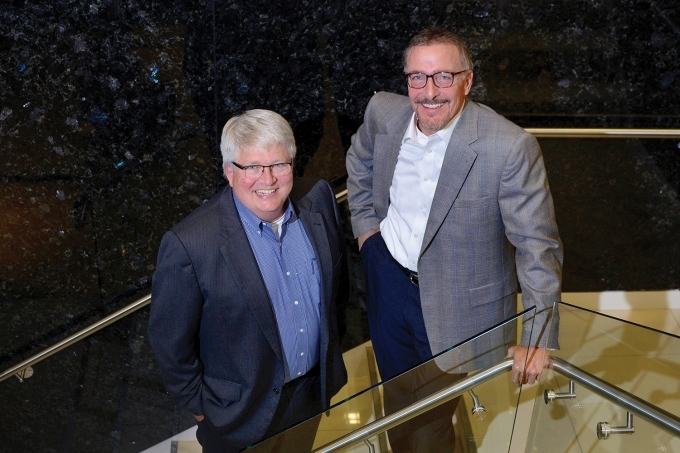 The pair, who first met three decades ago as undergrads at Central Michigan University, have worked both the buy-side and sell-side on more than 200 successful mergers, recapitalizations, buyouts, acquisitions and turnaround transactions. Prior to founding Tillerman & Co., they were partners at a turnaround and consulting firm in West Michigan. Lenio holds an MBA from the Ross School of Business at the University of Michigan. He is a founder and past director of the Association for Corporate Growth’s Western Michigan chapter and also serves on the board of MiQuest, a statewide organization that promotes entrepreneurship in Michigan. He is also a member of the Grand Rapids Public Library Foundation board of trustees and serves on the board of the Venture North initiative of the Traverse City Chamber of Commerce. Blanchard, a Chartered Financial Analyst, earned an MBA from the Columbia University Business School in New York City. He serves on the board of directors of the West Michigan Humane Society and volunteers for a variety of West Michigan organizations including Junior Achievement and the Grand Rapids Home for Veterans. Based in Grand Rapids, Mich., Tillerman & Co. provides investment and merchant banking services to middle-market businesses. The firm specializes in closely held and family-owned businesses with merger-and-acquisition advisory, capital sourcing and transaction support. The firm focuses on transactions valued between $3 million and $75 million in the manufacturing, distribution, agribusiness, energy, business services and consumer products sectors. For more information, visit tillermanco.com.